My story is similar to many who grew up in rural Wisconsin. Even though we went to college (UW – Eau Claire), experienced life in the big city (Minneapolis), and lived in Hawaii, we were drawn back to our roots. In 1993 we started looking for homes in the country. Both my wife (Cindy) and I grew up in the country and we had a five and three year old (Travis and Jessica) and wanted them to have similar experiences as we did growing up. In July, we found a home we both agreed on. The property had a very small pond. 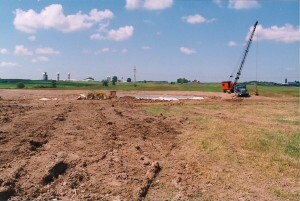 The excavation material from the pond’s construction was used for site fill when the home was originally constructed. As with most ponds dug for that purpose, it was small and didn’t function well as a pond. 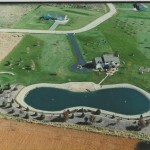 I had envisioned a large pond that could be used for swimming and fishing. Every day for the first two weeks after we purchased the property, I drove out at sunrise (we hadn’t moved yet) and staked out the ‘dream pond’. I looked at it from every vantage point; wanting it to be perfect. Once Cindy saw the final design, she thought it was too big, too close to the home; you get the idea. She is now very happy with the pond! So, now we had a pond. As everyone who owns a pond eventually finds out, ‘if you have a pond, you have problems’. Being a pond dummy, I did what most people do – went to the local co-op and had someone making $8/hour behind the checkout counter give me pond advice. I gladly followed his advice – it worked and was cheap; what else could a man ask for? One of Travis's first fish. That was until mid summer of 1998. After five years of the heavy chemical use recommended by my “pond consultant”, the pond was no longer responding. The idealistic dream of ‘a swimming pool you could fish out of’ was no longer the reality. We needed to try something different. The internet had just become a recognized tool, and I used it to learn about ponds. In this process, I learned a pond is an ecosystem that must be in balance for it to be successfully managed. One secret of successful management was the use of helpful microbial bacteria (similar to that used in septic systems or water treatment plants). My research showed there was an alternative to chemicals that made logical sense [This is the intelligent way of saying that a dumb man was just hit over the head with the blinding flash of the obvious.]. 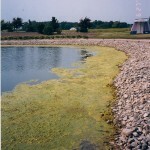 The discovery led me to a company that manufactured a bacteria blend for use in ponds. I couldn’t buy the product fast enough. I had a pond with a 20’ ring of algae around the entire perimeter and a mad wife. Holy motivated husband, Batman. After using the bacteria product for a week, I called the company to complain – their product didn’t work. Unbelievably, the CEO came to visit our pond. He had been in waste water treatment and developed a product he believed would work on ponds. He told me that I needed some patience – what took five years to destroy wasn’t going to be reversed quickly. His logic made sense. Admittedly, the concept of ‘patience’ is tough on this old dog, but I began to slowly see the benefits of a solid blend of helpful bacteria attacking the root of the problem. After a bit over two years of raking algae and using his product, the pond turned around. I had nearly wrecked our dream pond because the chemicals were destroying the ecosystem. I asked the gentleman if we (Travis, Jessica – now ages 13 and 11 – and I) could become distributors. He granted the request and in 2001, The Pond People® was born (I think the kids came up with the name). It started out as a simple business with the goal of teaching the kids about business. We home schooled, so this venture was a natural fit. We only had one product when we first started out, but went to work meeting pond owners. We learned that almost everyone was following the same foolish path we’d been on. 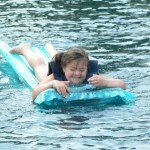 In 2002, Grace (our third child) was born. Grace was the starting point for a ton of change. Fortunately, God’s grace had come much earlier and we were ready to accept what He had planned for us. Grace has Down Syndrome. She has been a blessing and has taught us more about love than what you can imagine. By the end of 2004, a decision had to be made relative to the business. It was consuming a fair amount of time; the growth was more than we expected. Up until that point, I had been strategic planning for clients throughout Wisconsin, as our primary source of income. Having Grace helped make the decision. We felt there was a good chance Grace would live with us the rest of our lives and having a business she could be part of made sense. After jumping in, our search for the ultimate bacteria blend became a burning desire. It seemed the more we learned, the more important using the right bacteria had become. We were after more than cosmetic results. We wanted each pond to be as clean as the day it was dug. As we searched, we found that pond bacteria were like most products on the market; everyone was touting theirs as the best – someone was lying. Once we understood what to look for in bacteria (number of strains, the type of strains, how it grows, how it is introduced to the pond environment), we concluded a need for a special blend; something not available on the market. This decision led to our own proprietary blend. We also knew bacteria alone would not be good enough. We took on complementary product lines, vendors that supplied additional products and services (including supplying fish), and created a method to bring it all together. Grace proudly states, “I deliver fish with my dad!” We now have a complete pond management system – the natural solution to the chemical alternative. The protocol can be used on even the toughest ponds to get them off their chemical diet and reverse the aging process! 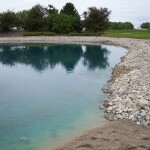 In a short time, we became a full service pond management company. Toward the end of 2010, we decided to franchise the business. Early in 2011 we could legally sell franchises in 40 states. We obtained the first federal registration of our name on May 24, 2011. Since then, we've devoted thousands of hours to training and organizing – setting the table for future franchisees. To facilitate our growth, late in 2011 we built our first warehouse, with offices and a training facility. In 2017, we built a manufacturing facility to make our proactive products. We have the best vendors, clients, team members, and stakeholders a person could ask for. We have been very fortunate. You could say we’ve been part of a miracle.